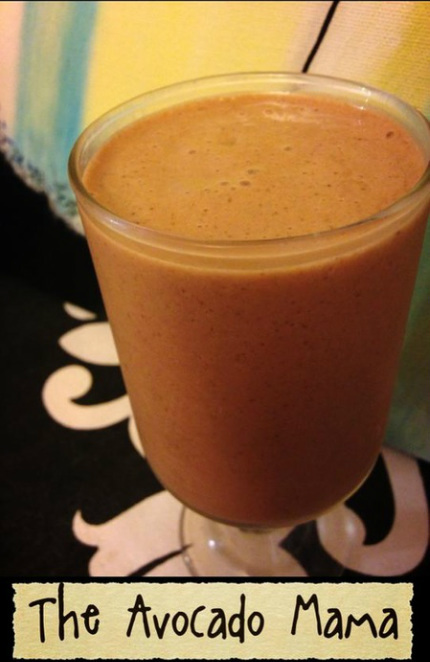 This satisfying smoothie has it all- sweet, rich, and healthy all in one glass! This is my go-to drink when I'm hungry in between meals. It also makes a delicious breakfast on-the-go! Blend all ingredients in a blender. Double this if you want to share! Note: If you want to really jazz this up, add 1/2-1 cup baby spinach and a TBS of mixed ground chia and flax seeds. Feel free to substitute any nut butter for the peanut butter. These cool days still have me looking for warm, comforting meals- and I found just that in the following Creamy Cauliflower Soup recipe from Engine 2. Serve this with a light salad, and/or a hunk of crusty bread, if bread is your thing. Heat onion, salt, and 1/2 cup water, then simmer on low for approximately 20 minutes, or until the onions cook down to a nice mush. Check to make sure the water is sufficient, and then add 1/4 cup water as needed, so the onions don&apos;t burn on the bottom of the pot. Add the potatoes, celery, carrots, and cauliflower along with 2 cups of water and the vegetable broth. Simmer until all of the vegetables are soft- about 20 minutes. Add the nut butter and tamari. Pour in batches to blend in a blender, or mash with a potato masher (or use an immersion blender) until the soup is mostly smooth.Season with cracked pepper and sea salt to taste. Variations: Add one bunch of freshly chopped kale, mustard greens, or collard greens 5 to 8 minutes before serving for extra tasty nutrition! The holidays are here, and for many of us, that means food, food, and more food. We are a fortunate bunch to be able to enjoy the holidays in abundance. I am always grateful that my family can participate in these holidays of plenty. I know that times are hard for many, and simply getting enough food may be a challenge. While I normally strive to feed my family as organically as possible, I know that it is sometimes difficult to find or afford organic foods. However, I just can't bend on keeping the most heavily sprayed foods away from my children's plates. For instance, if conventional (non-organic) strawberries are on sale for a great price, and there are no organic strawberries in sight, I am not willing to compromise my children's health just to save a little money. We simply skip the strawberries in this case. If you can keep your children's diets organic, that is wonderful. If you can only afford to purchase the "Dirty Dozen" organic, that will make a tremendous difference in the amount of pesticides you keep out of your children's diets. Pesticides can compromise our children's health even more than our own because their bodies are smaller and still developing. Not all produce have equal levels of pesticides, however. For instance, a non-organic avocado or banana is rather low in pesticides compared to the high pesticide levels found on non-organic (conventional) strawberries, bell peppers, and potatoes. The Environmental Working Group has a printable list of the "Dirty Dozen" and "Clean 15". Print up your copy for your holiday shopping trip, and keep pesticides off your plate. What Can You Do About GMOs? By now, you have probably heard something about GMOs and the health issues they have been found to be linked to. There is so much evidence that GMOs are dangerous to the health of humans, animals, and the environment. But with the upcoming election, we have a chance to change this. California voters can vote YES to Proposition 37 and get GMO foods labeled. If you don't live in California, you can still help by financially supporting this movement, with as little or as much as you can. With large corporations pouring money into opposing the passing of Prop 37, every dollar to get it passed helps. Let's get GMOs labeled and let companies know that as consumers, we want to know what we're eating and what we're feeding our children. In the meantime, you can take precautions by avoiding the most common GM foods, or only purchasing them when listed as organic. Cotton, papaya, soybeans, corn, canola, and cow's milk are some of the foods to be aware of. To avoid the genetically modified version, choose organic. For a Non-GMO Shoppers' Guide from the Center For Food Safety, click here: Non-GMO Shoppers' Guide. It's that time of year again- Halloween is here! I have to say that this holiday has evolved to a very different experience for me than when I was a child. As a child, I didn't think twice about candy- I just ate it- especially the chocolate that I'd hide from my brothers. Today, I am responsible for the health of four amazing children, and I take that responsibility seriously. This is not to say I never allow any "fun" foods, but I do tread carefully in the land of junk food and make sure it doesn't become a staple in my kids' lives. What I want for my kids is for them to see junk food as either not food or holiday food (preferably not food). Last year, I lucked out when my oldest daughter (6 years old at the time) decided to trick-or-treat for UNICEF. She didn't even accept the candy being offered to her. "No, thank you", she said. When she and her siblings came home from their neighborhood walk, we had a great time trick-or-treating in our house. My husband, teenage son and I each handed out healthier treats that our younger children love, as they knocked on closet and bedroom doors that we pretended to be our "houses". My younger daughter is still excited about the candy that she'll collect, even though she'll filter out a large portion of it to the "toss" pile, due to animal-derived ingredients. This will leave only a few pieces of candy that she may or may not want. Either way, she will still get to enjoy the homemade goodies we'll hand out when the crew comes home from their walk. Yes, the thought of those few pieces of candy is grating on my mind, so here is another thought. Wouldn't it be great if people handed out something other than candy? Stickers, glow bracelets, organic raisins... Ok, maybe not organic raisins. I tried that last year, and a boy threw his box of raisins back into our yard when he thought I wasn't looking. No need to take all of the fun out of Halloween. If we start with our children, we can create a future where the holiday season doesn't kick off with a bag of poor nutrition. Change the contents of the bag, and you will change the health of the children. 'Twas the night before grocery day, and what could I do? 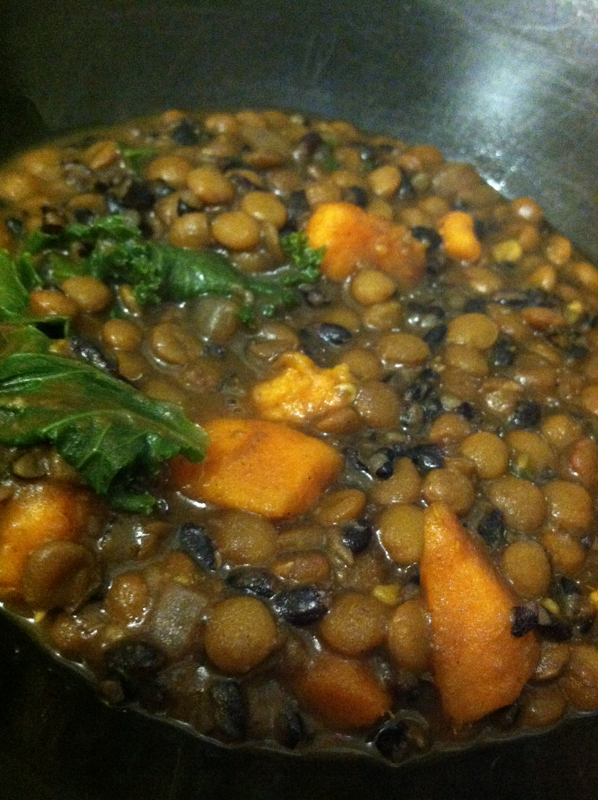 I created this simple and tasty lentil stew. For a lower-fat version, omit the coconut and coconut milk. Sauté the onions and garlic in water until soft. Add remaining ingredients, except for kale, and bring to a boil. Reduce heat to low/medium with a lid slightly askew, and let simmer for about 40 minutes. Check water level and stir occasionally, adding more water if it gets too dry. Stir in kale, and let cook 5 more minutes. Serve with sliced limes and add sea salt to taste. Blend all together in a blender, and strain through a nutmilk bag. There are many people who ditch animal products and processed foods for health reasons, and finally get down to their ideal weight. Yet some find that even though they are eating the healthiest foods, they just don't lose those stubborn 10-15 pounds that keep them from the body they had hoped to achieve on a plant-based diet. One of my favorite authors, Chef AJ, shares how she discovered what was stopping her from losing the weight, and how she changed her diet to slim down. Salad dressings:Should you go oil-free? Got salad? Good! Got a dressing loaded with oil and empty calories? Wait a minute- salads are supposed to be healthy, right? So why go through the work of making a colorful, nutritious salad, only to douse it in a unhealthy dressing? 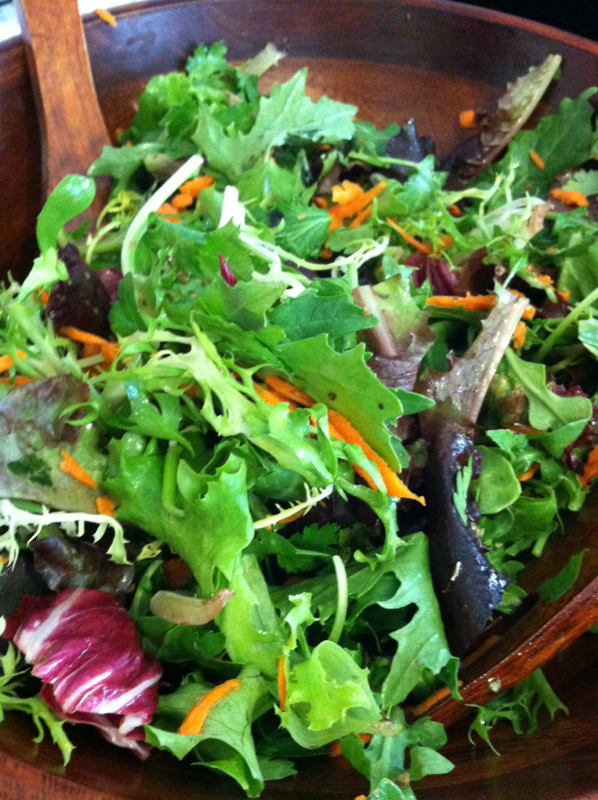 There are plenty of healthy options to top your salad and feel 100% guilt-free about your choices! I am all for low-fat dressing options, but I don't always leave out all fat. I have read and researched no fat versus low fat, oil-free versus the olive oil/coconut oil debate, and have come to the conclusion that there is a lot of conflicting information out there! My personal choice tends to lean towards the low-to-no-oil side, but I do occasionally consume coconut oil, and unheated olive, flax, and hemp seed oils. When I say occasionally, I don't mean daily- maybe not even weekly, and yes, the voice of Dr. Esselstyn does mentally lecture me as I drizzle on the oil. Recent studies have found that adding some fat to your food actually increases nutrient absorption. While this gives me some solace, I know that the healthiest fats come from whole food sources, such as avocados, nuts, and seeds. So, chop some avocado, or sprinkle on some sunflower seeds- just avoid the oil-heavy dressings for best results. Have your salad and eat it, too! *Drizzle means about 1-2 tsp, just enough to feel like you're being defiant. 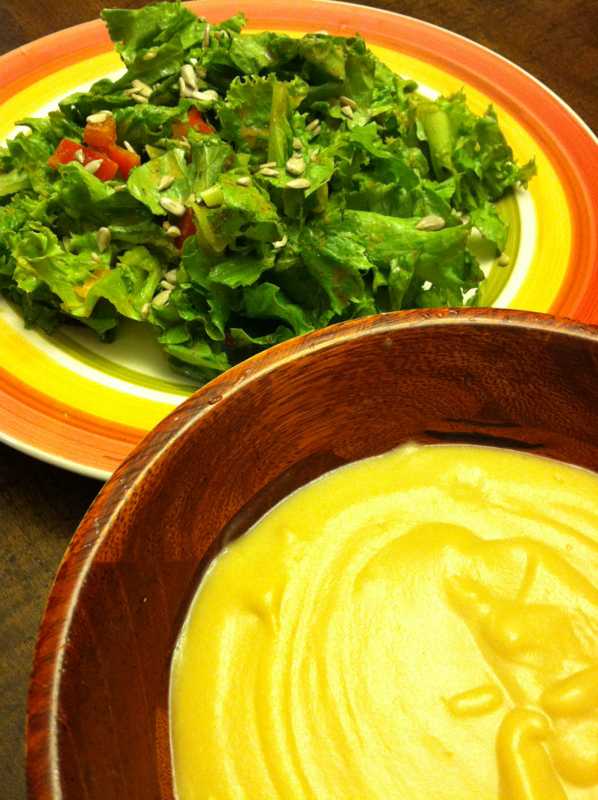 The dressing is perfectly delicious without any added oil.